Jonathan Figueroa (born April 26, 1982) is a Puerto Rican retired professional wrestler and promoter better known by his ring name, Amazing Red, or simply Red for short currently working on the independent circuit. He is best known for working for Total Nonstop Action Wrestling (TNA), where he is a former three-time X Division Champion and one-time NWA World Tag Team Champion, while also working on the American independent circuit. Figueroa is also the founder of House of Glory wrestling school, where is also one of the head trainers. He is the cousin of wrestlers Joel and Jose Maximo and Zelina Vega. Figueroa originally wrestled as Red, but Savio Vega decided to expand his ring name to include the word "Amazing" while he worked for the International Wrestling Association in Puerto Rico, giving origin to his more common pseudonym, Amazing Red. Red, who was already known for his work in the United States independent circuit, joined Total Nonstop Action Wrestling at its 2002 inception, quickly establishing himself in its X Division. During his first run in TNA Red held both the TNA X Division Championship and the NWA World Tag Team Championship with Jerry Lynn, simultaneously. While working for TNA he also wrestled for Ring of Honor as a member of the three man tag team The S.A.T. with cousins, Jose and Joel Maximo. Eventually he began to team with "The Phenomenal" A.J. Styles, becoming known together as Amazing Phenomenon. The team would go on to win the ROH Tag Team Championship from Christopher Daniels and Donovan Morgan. Through late 2003 Amazing Red wrestled as Misterio Red as well as Airwalk Spriggan while on a tour with All Japan Pro Wrestling. During the tour he suffered a near career-ending knee injury, tearing his anterior cruciate ligament and having to undergo surgery which kept him on the sideline for an entire year. Red returned to TNA to wrestle in March 2004, staying there for the majority of the year. When he left TNA he went back to the independents, only returning on occasion to TNA throughout 2005 and 2006. He also wrestled CM Punk in a dark match at a WWE SmackDown taping on May 12, 2005. 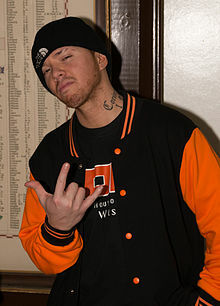 Red's last appearance was at a New York Wrestling Connection event at the beginning of 2006, where he lost his match to Javi-Air and re-injured his knee. It was made official on the Pro Wrestling Unplugged Website that he would be making his return to their "Haunted" event although he requested off since it was announced that his wife was expecting their child on March 14, 2008. After being on the sidelines with his injury, Red made his return on December 13, 2008, at Jersey All Pro Wrestling's Best of the Light Heavyweights, the match was won by Archadia as he defeated Amazing Red, Flip Kendrick, and Louis Lyndon. In April 2009, it was announced via the TNA website that the Amazing Red would return to the company in the Team 3D Tag Team Invitational Tournament. On the April 30 edition of Impact! he teamed with then-X Division Champion Suicide to defeat the Motor City Machineguns of Alex Shelley and Chris Sabin. Suicide and Amazing Red were eliminated from the tournament on the May 14 episode of Impact! by the new stable, The British Invasion after interference from the Motor City Machineguns. On the May 28 edition of Impact!, he challenged Suicide for the X Division Championship but was unsuccessful in winning the title for a second time. Red competed in a Steel Asylum match at the Hard Justice Pay-Per-View on August 16, in another losing effort. On the October 1 edition of Impact! Red became the number one contender to Samoa Joe's X Division title by defeating Jay Lethal, Consequences Creed, Sheik Abdul Bashir and Kiyoshi in a ladder match. On the following Impact! Red won the X Division Championship for the second time by pinning Samoa Joe following interference by Bobby Lashley. On the October 15 edition of Impact! Don West debuted as Red's new manager. At Bound for Glory Red retained his X Division Title in an Ultimate X match against Homicide, Daniels, Suicide, Alex Shelley and Chris Sabin. The following week on Impact! Red lost to Homicide in a non-title match. The return match between the two was booked for Turning Point, where Red was able to retain his title. Afterwards Don West quietly broke off his affiliation with Red, while he went on to defend his title on TNA's weekly Webmatches against the likes of Chris Sabin and Homicide. At Genesis Red retained his title in a match against the returning Brian Kendrick. On the January 28 edition of Impact! the British Invasion attacked Red after his six-man tag team match. As Rob Terry was going to cash in his "Feast or Fired" briefcase, which gave him the right to challenge for the X Division Championship anytime, anywhere, his stable mate Doug Williams managed to convince him to hand it over to him and defeated Red to win the Championship. On the April 12 edition of Impact! Red took the place of the injured Hernandez and teamed up with Matt Morgan to successfully defend the TNA World Tag Team Championship against the Motor City Machineguns. After the match Morgan attacked Red for getting the pinfall in the match. After a few weeks out of action, Red returned to Impact! on the June 10 edition, in a losing effort against Kurt Angle. On September 23 Red defeated Jay Lethal at a live event in his hometown of New York City to win the X Division Championship for the third time. Red re-lost the title to Lethal two days later at a live event in Rahway, New Jersey. On the December 23 edition of Impact! Red answered Jeff Jarrett's MMA Challenge, but was defeated by submission. After the match Red told Jarrett that he had a younger brother, who would answer the challenge the following week. The following week Red's storyline brother, billed simply as Little Red (later renamed Crimson), answered the challenge and was winning his match against Jarrett, before Jarrett was pulled away from the ring by his security guards Gunner and Murphy. Shortly afterwards, Crimson broke away from Red and the relation between the two was seldom mentioned again. On the April 19 edition of Xplosion, Figueroa debuted as Sangriento, a masked luchador, in a three–way match, where he defeated Jay Lethal and Chris Sabin. Sangriento made his Impact! debut on May 5, defeating Suicide. After defeating Suicide in a rematch the following week, Sangriento was not seen again for two months, until appearing in a backstage segment with Eric Young at Destination X on July 10. At the same pay-per-view Amazing Red wrestled in an X Division number one contender's Ultimate X match, which was won by Alex Shelley, and which would turn out to be his final match for the promotion. On August 4, 2011, Figueroa announced via his Twitter account that he had parted ways with TNA. On March 4, 2012, Red returned to Ring of Honor at the 10th Anniversary Show, where he teamed with T.J. Perkins in a losing effort against the House of Truth (Michael Elgin and Roderick Strong). In June 2012, Red wrestled a tryout dark match for WWE. Also, Red opened his own training school, House of Glory. 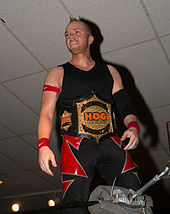 During his stint in the company, he become one-time HOG Tag Team Champion with his former teammate Crimson after defeating the Young Bucks. He also won the HOG Heavyweight Championship at House of Glory's "High Intensity 6" and would hold the title for a record setting 364 days. He lost the title almost a year later at "High Intensity 7" to Anthony Gangone in a No Ropes Match. Red would be forced to join the House of Gangone stable, and would then, of his own chose, turn heel by attacking two of his students, Private Party (Marq Quen & Isiah Cassady). On April 1, 2019, Red announced his retirement from professional wrestling. ^ a b c d e f g h i j k l "Online World of Wrestling Profile". Online World of Wrestling. Retrieved 2009-07-05. ^ a b c d e f g h i "Cagematch Profile". Cagematch. Retrieved 2009-10-13. ^ Meltzer, Dave (2011-05-05). "Thurs. update: Vince talks WWE financials, new plans, PPV numbers, Chyna in TNA, TUF rating, Couture". Wrestling Observer Newsletter. Retrieved 2011-05-06. ^ Katz, Jeff (2011-11-24). "WRP First Look: Day 4". Geekweek. Retrieved 2011-12-01. ^ a b c "TNA Wrestling profile". Total Nonstop Action Wrestling. Archived from the original on 2011-05-19. Retrieved 2010-01-25. ^ a b Boutwell, Josh (2011-05-06). "Impact Results - 5/5/11". WrestleView. Archived from the original on 2011-05-07. Retrieved 2011-05-06. ^ "Trainers". House of Glory. Archived from the original on 2011-08-27. Retrieved 2011-04-24. ^ "Los Maximos". Online World of Wrestling. ^ "Amazing Phenomenon". Online World of Wrestling. ^ a b "Ring Of Honor Tag Team Championship". Ring of Honor. Archived from the original on 2010-04-12. Retrieved 2010-04-05. ^ "Exclusive Interview with The Amazing Red". Total Nonstop Action Wrestling. Archived from the original on 2007-09-30. Retrieved 2007-08-24. ^ "PWU Haunted". Prowrestlingunplugged.com. Retrieved 2008-02-26. ^ "Jersey All Pro Wrestling 11th Anniversary Show". JAPW.net. Archived from the original on 2008-09-25. Retrieved 2008-11-21. ^ Sokol, Bryan; Sokol, Chris (2009-10-02). "Impact: Elite Mafia meltdown". Slam! Sports. Canadian Online Explorer. Retrieved 2009-10-13. ^ Wilkenfeld, Daniel (2009-10-15). "WILKENFELD'S TNA IMPACT REPORT 10/15: Ongoing (but suffering an hour lag) "virtual time" coverage of Spike TV broadcast". PWTorch. Retrieved 2009-10-16. ^ Wilkenfeld, Daniel (2009-10-22). "WILKENFELD'S TNA IMPACT REPORT 10/22: Ongoing "virtual time" coverage of Spike TV broadcast". PWTorch. Retrieved 2009-11-27. ^ Caldwell, James (2009-11-15). "CALDWELL'S TNA TURNING POINT PPV REPORT 11/15: Ongoing "virtual time" coverage of A.J. Styles vs. Samoa Joe vs. Daniels". PWTorch. Retrieved 2009-11-27. ^ Csonka, Larry (2009-12-08). "Complete TNA Impact Taping Results (SPOILERS)". 411Mania. Retrieved 2010-01-05. ^ Martin, Adam (2009-12-09). "SPOILERS: 12/8 Impact TV tapings". WrestleView. Retrieved 2010-01-05. ^ Wilkenfeld, Daniel (2009-01-28). "TNA Impact Report 1/28: Ongoing "virtual time" coverage of Spike TV broadcast". PWTorch. Retrieved 2010-01-29. ^ Caldwell, James (2010-04-12). "CALDWELL'S TNA IMPACT RESULTS 4/12: Ongoing "virtual time" coverage of Spike TV show - Jeff Hardy vs. Roode, Team 3D vs. The Band". PWTorch. Retrieved 2010-04-14. ^ Wilkenfeld, Daniel (2010-06-10). "Wilkenfeld's TNA Impact report 6/10: Ongoing "virtual time" coverage of Spike TV broadcast". Pro Wrestling Torch. Retrieved 2010-06-12. ^ Wilkenfeld, Daniel (2010-12-23). "Wilkenfeld's TNA Impact report 12/23: Complete "virtual time" coverage of Spike TV broadcast". Pro Wrestling Torch. Retrieved 2010-12-31. ^ Keller, Wade (2010-12-31). "Keller's TNA Impact report 12/30: Morgan & Mystery Partner vs. Anderson & Mystery Partner, Knockouts Brawls, Jarrett vs. Amazing Red's little brother". Pro Wrestling Torch. Retrieved 2010-12-31. ^ Caldwell, James (2011-01-27). "Caldwell's TNA Impact report 1/27: Complete "virtual-time" coverage of Team Angle vs. Team Immortal, Anderson vs. Hardy, Flair goes nuts, Steiner returns". Pro Wrestling Torch. Retrieved 2011-08-05. ^ Caldwell, James (2011-05-12). "Caldwell's TNA Impact report 5/12: Ongoing "virtual-time" coverage of big reveals, final PPV hype, battle royal main event". Pro Wrestling Torch. Retrieved 2011-08-05. ^ a b Caldwell, James (2011-07-10). "Caldwell's TNA Destination X PPV results 7/10: Ongoing "virtual time" coverage of live PPV - Styles vs. Daniels, Ultimate X, RVD vs. Lynn". Pro Wrestling Torch. Retrieved 2011-08-05. ^ Martin, Adam (2011-08-04). "X Division star says he is no longer with TNA". WrestleView. Archived from the original on 2011-08-25. Retrieved 2011-08-04. ^ Gerweck, Steve (2012-06-20). "Report: Former TNA wrestler receives WWE tryout". WrestleView. Archived from the original on 2013-02-17. Retrieved 2012-06-21. ^ Johnson, Mike (2013-10-18). "Hell Freezes Over: complete ICW coverage from NYC". Pro Wrestling Insider. Retrieved 2013-10-19. ^ "PWS Suicidal Six Way Championship". CageMatch. ^ "RWA Cruiserweight Championship". CageMatch. ^ "United States Extreme Wrestling title histories". Wrestling Information Archive. Archived from the original on 2010-09-19. Retrieved 2010-09-15. Wikimedia Commons has media related to Amazing Red.